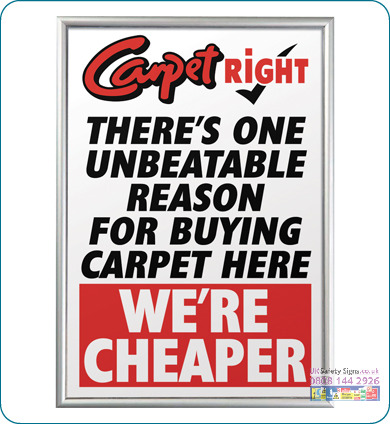 Select Page Home - DIY Supplies - All Signs & Labels - Braille Tactile Signs - Car Park Signs - Construction Signs - Fire Exit Signs - Fire Sign Photoluminescent - Fire Sign Braille - Fire Fighting Signs - Fixings & Fittings - Floor Signs - Labels - Lock Out Tags - Padlocks & Keys - Permanent Road Signs - Photoluminescent Signs - Polished Gold Effect Signs - Private Road Signs - Prohibition Signs - Office Signs - Mandatory Signs - Warehouse Identification Signs - Road Signs - Q Road Works Signs - Roll Up Road Signs - Safety Posters - Safety Reports & Books - Scaffolding Banners - Sign Frames Sign Fixings - Sign & Labels Accessories - No Smoking Signs - Stencils - Street Signs - Temporary Road Signs - Triflex Road Signs - Tapes Floor Treads - Traffic Mirrors - Letters Numbers - Warehouse Identification Signs - Warning Signs - Visual Displays - Architectural Ironmongery - Door Finger Plates - Bolts & Brackets - Cords Locks Pulleys Wheels - Cycling & Car Care - Decorating Supplies - Electrical Supplies - Gardening & Ropes - Hooks Hinges Catches Door Stops - Household Cleaning - House ware & Kitchenware - House Names Numbers Plaques - Nails Fixings & Screws - Plumbing Supplies - Pets & Pest Control - Pipeline Marking Banding Tapes	Sign Printers Clothing Suppliers Vehicle Signs Display Signs Safety Signs Printing - Sign Manufacturing - Sign Questionnaire - Vinyl Lettering - Vehicle Livery - Vehicle Questionnaire Contact Us. 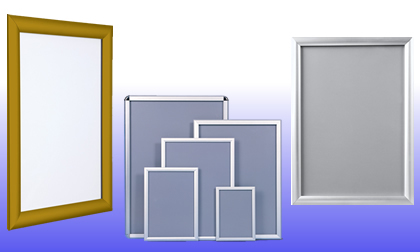 Competitive suppliers of standard aluminium, framed snap frames for displaying posters and menus on walls. 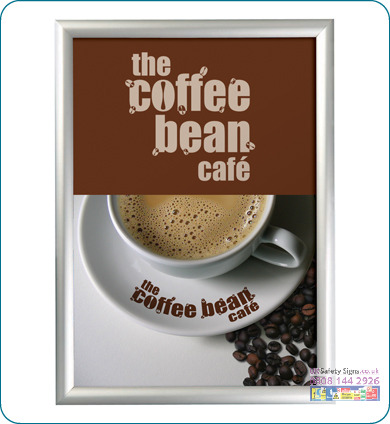 Our low cost snap frames will allow you to display information to your staff and customers alike. These correx backed snap frames will allow you to insert printed materials at A5, A4, A3, A2, A1 and 20 x 30 inches, 30 x 40 inches as well as 40 x 60 inches. They are supplied with a thin clear plastic sheet that will hold the printed material in place. By offering loyalty discounts our regular clients have saved money on competitively priced snap frames by using our 1 stop graphics service.